I have made no secret about my distaste for cooking. Decorate your house, fold your laundry, clean your room? No problem. Cook? Um, no. Of course, I do have a family and they do have to eat, but whenever possible I take the fast route and cheat my way to dinner prep. My super easy meatloaf recipe is no exception. I use one pan, a few simple ingredients and I am guaranteed a meal that everyone will eat, in no time at all. 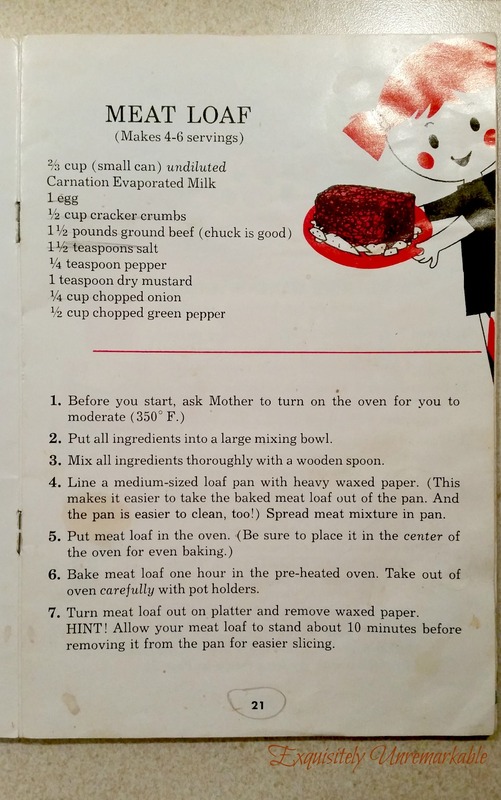 I have been making meatloaf for years. It was actually the first thing I ever made by myself. It's really hard to mess up a meatloaf and you can serve it with virtually any side dish, so it has always been my go to in a pinch. Today, is a perfect example. My daughter asked me to make stuffed peppers this week. I bought the meat, the peppers and was ready to go, when everything went haywire. I had email issues, college forms to fill out, a sick kid who needed a doctor appointment, a husband who was traveling, we lost power several times due to some wicked storms and by this morning, the house was a mess. When I had finally finished cleaning it up, the last thing I wanted to do, or had the energy to do, was whip out several pans and my splatter guard to make rice and fry up chop meat, then get a baking dish, a cutting board and some utensils out. I just kept thinking about the clean up. I'd have to do it all over again. 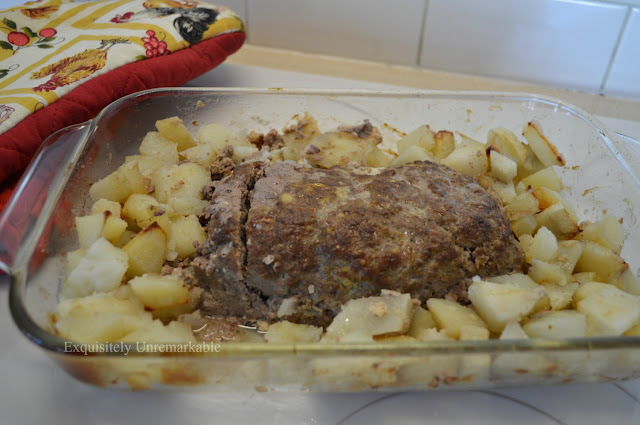 The way I make meatloaf is ridiculously simple and it only requires one baking dish. I do not mix everything in a separate bowl, chop up a ton of stuff, I don't measure anything out with spoons or cups. Then in the pan I take my hands and mush it together really well, making sure that all the spices get spread around and worked into the meat evenly. I shape it into a loaf and boom. I'm done. I do not add crackers or breadcrumbs to my meatloaf. Perhaps it's the Italian in me, but I just want it to taste like a giant meatball. I obviously don't put any bread in those either. It's funny, even way back when, you can see that I was not a fan of the bread! Today, I did however add potatoes. I peeled and chopped up two large baking potatoes. Once in the pan, I drizzled a little bit of olive oil on them, salt and onion powder. The pan went into the oven and I baked it, uncovered, at 350 degrees for about 50 minutes. That was it. When all was said and done, I had a small cutting board, one knife and vegetable peeler to deal with...and that was only due to the potato prep. Now that's my kind of cooking. Here's my finished product. Like my giant cut? That's how I tell if it's done. I know what you're thinking...but it works for me. Now, I could've shown it to you on a plate with sides and garnish, but lazy here, remember? Actually, that is only partly true. The reality of the situation is that I made this dish at 10am. I've already covered it with foil and when it cools, I will tuck it into the fridge until dinnertime. Putting it on a plate (which I would have to wash) and taking out food I wasn't going to eat right now (and then have to put away) to take a Pinterest worthy shot would totally defeat my one pan and done goal. That is why there is no drool worthy photograph. And as far as I'm concerned, there's nothing more delicious, than clean! Are you a cheat in the kitchen? Wow! 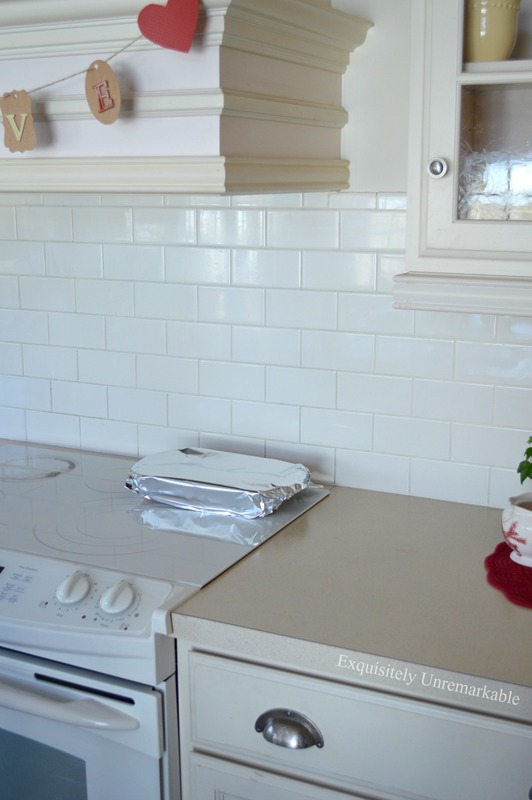 that was quick and yes, your kitchen is still sparkling clean. I have never tried with the potatoes in the loaf pan but there is a first time for everything. Have a great weekend! You had me at CHEATLOAF! LOL!!!!! You are funny Kim, and yes, I do a lot of short cuts when I cook too, we can't be all like Martha who does housekeeping for a living, literally! THank you for sharing! Gotta love an easy meatloaf recipe. A giant meatball? Oh, yeah my husband and son would go for that! I love the meals you can make in the morning too. I can play later into the day! Your meatloaf looks very good. And so does your kitchen. 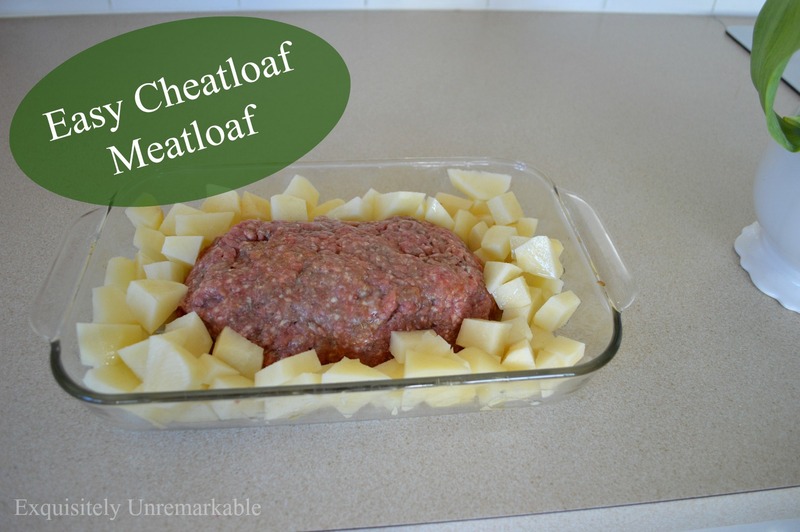 I have never added anything around the meatloaf before but I will have to try. Drizzled in oil and roasted is one of my favorite ways of cooking potatoes. Do you think you could do the same thing with squash or sweet potatoes or a combination. Oh, I never thought of doing that with squash or sweet potatoes, Lorri. While I love those two veggies, I am such a creature of habit. Thanks for the suggestion! finally! a brilliant cook on the internet that cooks like I DO!!! i just kept saying YES! throughout the whole post! and the addition of the potatoes. now why in heck did i never think of THAT? so simple. so GOOD! my favorite cookbook is the 'i hate to cookbook' by peg bracken. Tammy, I am still staring at those words "brilliant cook" with stars in my eyes...thank you...but did you just say there's an I Hate To Cook Book?? Oh my, off to Amazon!! Right now!! Thanks for an easy recipe! You know I'm not gifted in the kitchen. I can make this in my Breville Smart Oven. When I show recipes, which isn't often, I don't glam up the scene either. I think it's rather fake. Like your clean kitchen! My hubby likes to cook and I really don't mind washing dishes, so it works out well for us, too, Judy! You are the real deal, Kim. This looks delicious and I truly know how our plans for a big dinner can go awry depending on how our days go. My two cents...chop your veggies. and stuff that morning, the night before, even a few days in advance and keep them in a plastic bag in the fridge. That gets you more than halfway there. I do this with a lot of meals---I'm more energetic in the morning. We love meatloaf! I do put crushed crackers in mine because we like the texture it adds. Everybody has their own preference and all that matters is you have a recipe you and your family love. Have you ever made Hobo Suppers? No...what are Hobo Suppers? Now I am curious! Yay!! Pinned at Thoughts of Home on Thursday. Thank you for rising early and posting with us. My husband is a sucker for meatloaf and I know he will love this, plus it's easy to do. Thanks for sharing! That looks yummy. I like to cook when I have time. I rarely have time. Little by little I am getting rid of my cookbooks and relying on recipes I find online. I would rather do anything than clean, though, so quick and no-fuss recipes work for me! I just looked at your sweet potato pancakes - they will feature here this week! I do meatloaf two ways : In separate pans...that way is good for cold meatloaf sandwiches and your way...with potatoes in the pan. Here's a little thing to try for next time. Distribute some cut up onion all around, do your oil as usual BUT squirt some ketchup here and there over potatoes and meatloaf alike. :) Got that one from my sister years ago and it's great. Yum!! I love that idea, Deb, thanks! Thanks Carla. It's how my mom used to make it! I think the meatlof looks great!! I do like cooking however now a days I only cook 3 or 4 days a week. I really and really like the looks of the sweet potato pancakes. I love sweet potatoes!! I have forgotten how good a simple meatloaf is. thanks for your quick and easy recipe. 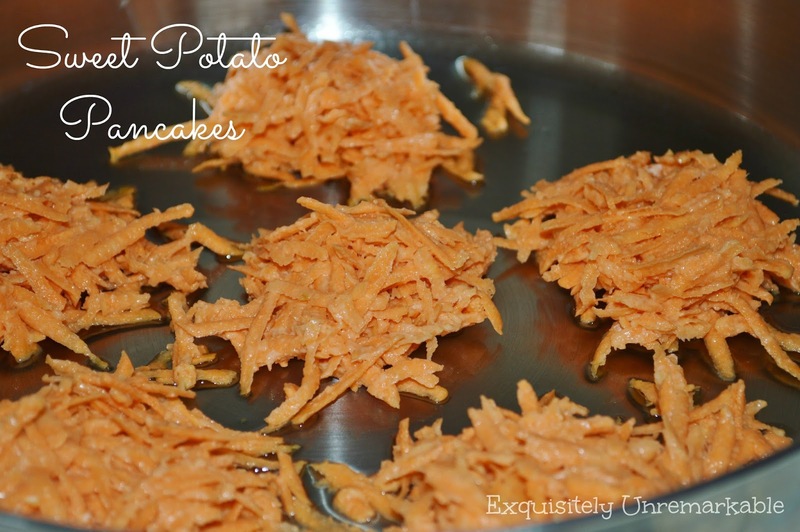 the sweet potato cakes are on my list to make too. We LOVE meatloaf in our house too. 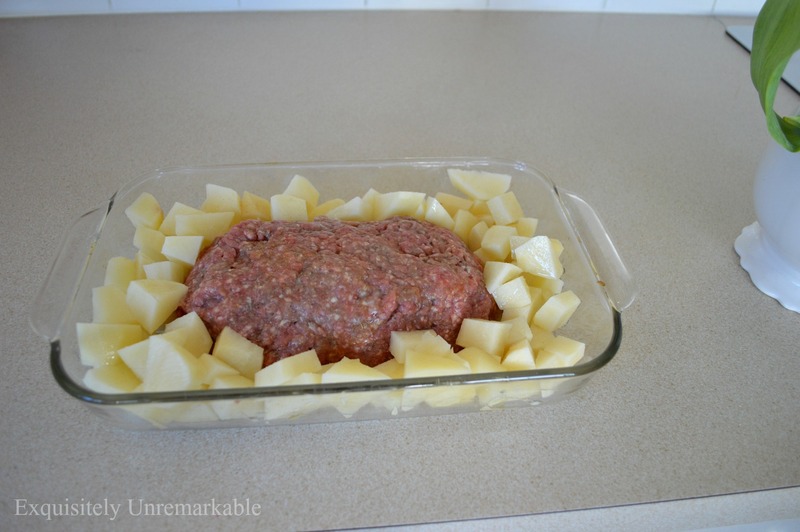 I love the idea of putting in cut up potatoes along with the meatloaf Kim. You are a genius! Thanks, I'm going to do that the next time I make meatloaf. Thank you, Julie! I had no idea that most people don’t add potatoes around their meatloaf. I guess it was something that I grew up with so I figured everyone did it, but from the comments I can see that it is unusual! Glad I could share something of use! This sounds really good, and even for someone who typically enjoys cooking, I like to have some easy recipes for "those" days! A great idea Kim. I'm slways adding and adding things to my meatloaf. Maybe that's why they don't eat it...lol. Ha! My kids like simple, too, Mary! I found a meatloaf recipe a few yrs ago that used V8 juice & so love the flavor it adds. My husband is addicted to ketchup so there has to be a ketchup topping as well. I've hand copied it in my 'heirloom' cookbook....our family's tried & true recipes I don't want to lose, so I cannot remember at all where I got it. It's called Boston Market meatloaf but if you google that, this recipe doesn't come up. I'll type it out here just for you! but you don't need to feel obligated to try it. If you ever feel inspired though, it's definitely a keeper at my house. I also think you really don't need to measure, just eyeball it & no chopping needed. I also mix it in the pan I'm baking it in so very easy clean up. Mix 1st 5 ingredients, combine meat & mix well. Cover with foil & bake at 400' for 40 minutes. Drain grease (carefully!) then top with ketchup, just spread on as much as you like. Pour juice around the edges, not over the top & bake another 40 minutes. I may try adding chopped potatoes around mine the next time...that looks really good. 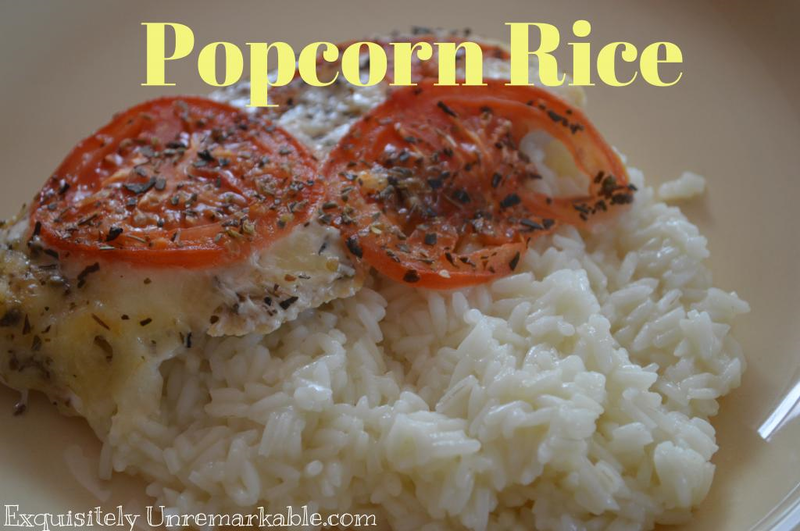 Jenny, thank you for taking the time to share this recipe with me...and my readers! I am totally going to try this and you know why? Onion soup mix!! Oh my goodness, that is my weakness and I never thought about putting it in meatloaf! My mom always mixed ketchup in her meatloaf, then smeared it on top and added bacon as a garnish! I have scaled ours down quite a bit, but that onion soup mix is calling my name!! Thanks again for sharing Jenny@!! I'm a big onion soup mix fan as well. I use it as a dry spice on so many things. I have to buy more, because now you have me thinking…have you ever used it in beef stew? No but I do use it often on any meat in the crockpot...beef or roast pork, chicken. Just add your favorite veggies. My favorite combination is mushroom, onion & tomato...sometimes broccoli or cauliflower. We rarely eat potatoes with a Type I diabetic in the house but that would be really good to add with carrots as well. I do toss vegetables in olive oil then toss in soup mix & roast in the oven for a really yummy side dish. Lipton has so many great flavors....I love doing this with Ranch dip mix as well. I do not enjoy cooking either, so this is perfect. :) I've actually gone down to cooking dinner only one day a week. We have one "fend for yourself" night where everyone eats sandwiches, soup, etc. and the rest of the nights we pick up something like pizza, sandwiches from the deli, Chick fil A, etc. It may not be the healthiest, but even when I cooked almost every night, it wasn't that healthy (think frozen meatballs with spaghetti, Stouffer's lasagna, burgers...) My mom says "every woman has a set amount of meals in her that she'll cook and when she reaches that number, she quits cooking." Hee hee! I love Cheatloaf! Those one pan meals are my favorites (and the chief dishwasher aka hubby agrees). I do easy but when I am cooking up something special . . . every pan and utensil seems to be out. I do have that "clean streak" going for me though! I think I am going to try your "no crackers" meat loaf . . . I think your dinner is absolutely drool worthy and I bet it's delicious. I definitely think you can cook simply without sacrificing flavor. Wish I was eating at your house tonight! Thanks so much, Susan! You're invited anytime! We love meatloaf at our house too. I love making it with ground chicken!! Yummmy!! Your reasons for not cooking are the same as mine - there are just too many other things I like to do. Fortunately, my husband thinks of cooking as creating and he enjoys it all. How did I miss this post of yours? Oh my! You cooked! LOL :) I love the one dish dinners, and the fact that it can be made earlier in the day, even better :) Yum! I love how you put the potatoes around the meatloaf to bake. I'm going to try that! It all looks delicious! Thanks Lisa. It's so easy, just chop and go! You clever girl I love how you added potatoes to a family favorite. Thank you ever so much for linking up at Thoughts of Home on Thursday. Your presence adds such a ray of sunshine! You're so kind, Laura! Thank you. I am going to try this method, especially as 90% of my kitchen is packed up! There are only so many nights I can stand take-out meals. Easy meals are top priority for me now, and you are so right--the family hast to eat! Super easy and one pan Dewena...easy enough to grab out of a box! ; ) Yikes...packed up!